Sounds cheesy, but trust me – it'll help!!! Why do people commit crimes prior to labels? It implies no labels = no deviance. The people who commit crimes but are not labelled on deviant? People are unaware they are deviant until labelled? It fails to examine links between labelling and capitalism, so focuses on middle range officials such as police who apply labels rather than the capitalist class that make the rules. The left picture is an example of disintegrative shaming. A type of labelling where not only the crime is labelled as bad but also the offender. This can lead to the offender becoming excluded from society and as Lemert argues can lead to secondary deviance. The next picture is reintegrative shaming. (Although, the whole billboard thing is bad anyways). This is where the act itself is labelled as bad rather than the offender. “So she did a bad thing but she is not a bad person”. Reintegrative shaming prevents the individual from being stigmatised; lets the individual know the negative impacts of their actions and makes it easier to be accepted back into mainstream society . This reduces the chance of secondary deviance. Primary and secondary deviance is best explained through examples, so I’m going to use the character of Tommy to explain what Lemert means by primary and secondary deviance. So Tommy is five years old and his mother has taking him to WH Smith. Now everyone knows that WH Smith has a pick and mix stand and Tommy loves his chocolate. So when mummy isn’t looking, Tommy takes some chocolate mice and carries on like nothing happened. Unfortunately, the clerk saw him eat the chocolate and he gets into trouble with mummy. This is primary deviance. The clerk doesn’t call the police because it’s justified as childhood behaviour. When Tommy gets older, he would describe it as a “moment of madness”. 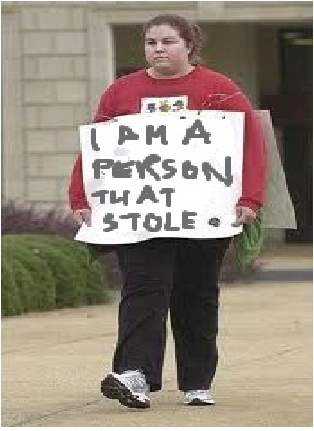 No one has labelled Tommy as a thief. It is not affected his status or how society views Tommy, therefore according to Lemert primary deviance is pointless to study as it has no effect on the individual or society. However, as Tommy gets older he continues to steal and at the age of 18 Tommy steals a car from the local Mercedes dealership. Tommy gets caught and sent to prison for 10 years but when he comes out he is still viewed as “that thief”. This makes it hard Tommy to get a job and because he needs money to survive, Tommy joins the neighbourhood gang and once again reverts to crime. This is what Lemert calls secondary deviance – crime caused by a societal reaction. Society viewed Tommy as nothing more than a thief, so “thief” became Tommy’s master status. This puts Tommy in a self-concept crisis because he doesn’t know how he fits into society any more – no one likes him, he cannot get a job – therefore self-fulfilling prophecy occurs and Tommy fulfils his label. He joins neighbourhood gang in order to be around people who accept his master status. Therefore, Tommy reverts to crime because of his label. The best way to explain deviance amplification is through the mods and rockers in the 1960s. 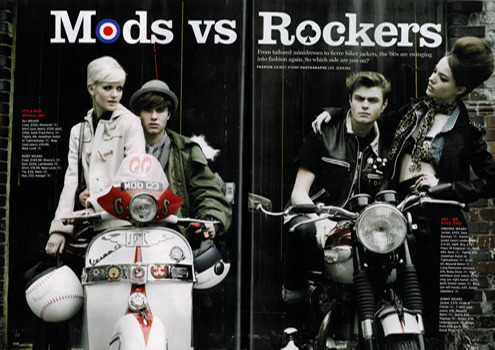 Mods and Rockers werre the two youth subcultures that existed in Britain at the time. You could easily tell who they were by their attire and the types of bikes they rode. But first, a video to explain the history of the people… Click the pic! Cohen highlighted how the media was able to label the Mods & Rockers as folk devils (bad people) and created a moral panic in Britain – people genuinely feared the two subcultures. This led to a sharp increase in the level of social control. Arrests were common and judges were harsher. As with the Brixton Riots, an increase in social control can make things worse not better. People may act out and fulfill their label (self-fulfilling prophecy) which creates more deviance. This leads to more conntrol, which leads to more deviance and the cycle continues… Deviance is amplified. Back in the 1980s (ish) there was some level of crime among the people of Brixton – and for those who don’t know, Brixton is a predominately black area. Now one day, the chief of police decided that there needed to be a crackdown on crime in Brixton. The next day Operation Swamp was born. Now what Operation Swamp meant was that the police had the right to stop and search anyone they felt was suspicious. In theory it made sense – stop trouble before it began. But after a while, it got a bit… out of hand. It was unlikely that a black person would walk out and not get stopped at least once. This was creating a lot of tension in Brixton – people were fed up. The aim of the story above is to explain the role of moral entreprenuers and social control. The moral entreprenuer here was the Chief of Police that decided that Operation Swamp would help reduce people that were victims of crime. What it actually did was simply create another group of people that could be arreseted – it made more deviants. An extension in the number of people you can arrest, inevitably leads to more arrests. the increase in arrests confirmed the police’s label that black people were criminals. The riot itself shows how social control can cause deviance. This is also referred to as deviance amplification. There was so much attention on the black community, they revolted.